Definition at line 904 of file _algo.c. Definition at line 27 of file _algo.c. Definition at line 1061 of file _algo.c. Definition at line 1381 of file _algo.c. 1403 //there is no need to call upper_bound. Definition at line 959 of file _algo.c. Definition at line 432 of file _algo.c. Definition at line 1581 of file _algo.c. Definition at line 1534 of file _algo.c. Definition at line 752 of file _algo.c. Definition at line 1020 of file _algo.c. Definition at line 935 of file _algo.c. Referenced by __chunk_insertion_sort(), __final_insertion_sort(), __inplace_stable_sort(), and __nth_element(). Definition at line 970 of file _algo.c. Definition at line 1968 of file _algo.c. Definition at line 2001 of file _algo.c. Definition at line 921 of file _algo.c. Definition at line 62 of file _algo.c. Referenced by __introsort_loop(), and __nth_element(). Definition at line 83 of file _algo.c. Definition at line 1115 of file _algo.c. Referenced by __inplace_merge_aux(), and __stable_sort_adaptive(). Definition at line 1503 of file _algo.c. Definition at line 1037 of file _algo.c. Definition at line 1074 of file _algo.c. Definition at line 1463 of file _algo.c. Referenced by __inplace_merge_aux(), __inplace_stable_sort(), and __merge_without_buffer(). Definition at line 1860 of file _algo.c. Definition at line 1314 of file _algo.c. Definition at line 1220 of file _algo.c. Definition at line 1256 of file _algo.c. Definition at line 676 of file _algo.c. Definition at line 697 of file _algo.c. Definition at line 1912 of file _algo.c. Definition at line 529 of file _algo.c. Referenced by __random_sample(), random_sample_n(), and random_shuffle(). Definition at line 605 of file _algo.c. Definition at line 626 of file _algo.c. Definition at line 508 of file _algo.c. Referenced by __inplace_stable_partition(), __merge_without_buffer(), __rotate_adaptive(), __stable_partition_adaptive(), and rotate(). Definition at line 1093 of file _algo.c. Definition at line 370 of file _algo.c. Referenced by __rotate(), and __rotate_aux(). Definition at line 403 of file _algo.c. Definition at line 443 of file _algo.c. Definition at line 500 of file _algo.c. Definition at line 154 of file _algo.c. 165 //__lookAhead here is always pointing to the last element of next possible match. 212 //__lookAhead here is always pointing to the element of the last mismatch. Definition at line 220 of file _algo.c. Definition at line 1708 of file _algo.c. Definition at line 1665 of file _algo.c. Definition at line 1751 of file _algo.c. Definition at line 1617 of file _algo.c. Definition at line 768 of file _algo.c. Definition at line 827 of file _algo.c. Definition at line 836 of file _algo.c. Definition at line 810 of file _algo.c. 814 return (__buf.size() > 0) ? Definition at line 1159 of file _algo.c. Definition at line 1182 of file _algo.c. Definition at line 952 of file _algo.c. Definition at line 944 of file _algo.c. Definition at line 907 of file _algo.c. Definition at line 883 of file _algo.c. Definition at line 295 of file _algo.c. Referenced by __unique_copy(), and unique_copy(). Definition at line 310 of file _algo.c. Definition at line 318 of file _algo.c. Definition at line 1356 of file _algo.c. Referenced by __equal_range(), and upper_bound(). Definition at line 273 of file _algo.c. Referenced by basic_string< char, char_traits< char >, allocator< char > >::rfind(). Definition at line 1601 of file _algo.c. Definition at line 1607 of file _algo.c. Definition at line 1553 of file _algo.c. Referenced by InplaceTest::inplmrg1(), InplaceTest::inplmrg2(), test_inplace_merge_1::operator()(), and test_inplace_merge_2::operator()(). Definition at line 1566 of file _algo.c. Definition at line 1985 of file _algo.c. Definition at line 1991 of file _algo.c. Definition at line 1800 of file _algo.c. 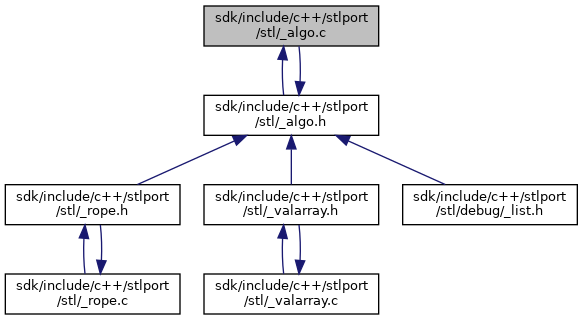 Referenced by valarray< bool >::max(), MaxTest::maxelem1(), and MaxTest::maxelem2(). Definition at line 1813 of file _algo.c. Definition at line 1419 of file _algo.c. Referenced by __merge_adaptive(), __merge_sort_loop(), create_diff_row_query(), ext4_ext_insert_extent(), gather_merge_data(), MergeTest::merge0(), MergeTest::merge1(), MergeTest::merge2(), MergeChmProperties(), MsiDatabaseMergeW(), nsChannel_SetResponseHeader(), parse_obj_node_param(), and test_IImageList_Merge(). Definition at line 1440 of file _algo.c. Definition at line 1828 of file _algo.c. Referenced by valarray< bool >::min(), MinTest::minelem1(), and MinTest::minelem2(). Definition at line 1841 of file _algo.c. Definition at line 1896 of file _algo.c. Referenced by PermTest::nextprm0(), PermTest::nextprm1(), and PermTest::nextprm2(). Definition at line 1903 of file _algo.c. Definition at line 1335 of file _algo.c. Referenced by NthElemTest::nthelem0(), NthElemTest::nthelem1(), and NthElemTest::nthelem2(). Definition at line 1344 of file _algo.c. Definition at line 1236 of file _algo.c. Referenced by __introsort_loop(), PartialTest::parsrt0(), PartialTest::parsrt1(), and PartialTest::parsrt2(). Definition at line 1245 of file _algo.c. Definition at line 1287 of file _algo.c. Referenced by PartialTest::parsrtc0(), PartialTest::parsrtc1(), and PartialTest::parsrtc2(). Definition at line 1299 of file _algo.c. Definition at line 738 of file _algo.c. Referenced by DiskIoctlSetDriveLayout(), PartitionTest::ptition0(), PartitionTest::ptition1(), and UpdateDeviceObjects(). Definition at line 1947 of file _algo.c. Referenced by PermTest::prevprm0(), PermTest::prevprm1(), and PermTest::prevprm2(). Definition at line 1954 of file _algo.c. Definition at line 650 of file _algo.c. Definition at line 660 of file _algo.c. Definition at line 560 of file _algo.c. Definition at line 582 of file _algo.c. Definition at line 540 of file _algo.c. Referenced by RndShuffleTest::rndshuf0(), and RndShuffleTest::rndshuf2(). Definition at line 549 of file _algo.c. Definition at line 519 of file _algo.c. Referenced by ft_stroke_border_arcto(), ft_stroker_arcto(), ft_stroker_cap(), FT_Stroker_ConicTo(), FT_Stroker_CubicTo(), ft_stroker_inside(), ft_stroker_outside(), GdipRotateMatrix(), RotateTest::rotate0(), RotateTest::rotate1(), and test_rotate(). Definition at line 112 of file _algo.c. 120 // Test for a pattern of length 1. Definition at line 246 of file _algo.c. 252 //We use find when __count == 1 to use potential find overload. Definition at line 260 of file _algo.c. Definition at line 1732 of file _algo.c. Referenced by SetDifferenceTest::setdiff0(), SetDifferenceTest::setdiff1(), and SetDifferenceTest::setdiff2(). Definition at line 1741 of file _algo.c. Definition at line 1689 of file _algo.c. Referenced by SetIntersectionTest::setintr0(), SetIntersectionTest::setintr1(), and SetIntersectionTest::setintr2(). Definition at line 1698 of file _algo.c. Definition at line 1780 of file _algo.c. Referenced by SetDifferenceTest::setsymd0(), SetDifferenceTest::setsymd1(), and SetDifferenceTest::setsymd2(). Definition at line 1789 of file _algo.c. Definition at line 1646 of file _algo.c. Referenced by SetUnionTest::setunon0(), SetUnionTest::setunon1(), and SetUnionTest::setunon2(). Definition at line 1655 of file _algo.c. Definition at line 993 of file _algo.c. Referenced by _Function_class_(), BnegateTest::bnegate1(), BnegateTest::bnegate2(), LocaleTest::collate_by_name(), LocaleTest::collate_facet(), FindProgramDlg::CompareFunc(), CountUniqueItems_Aux(), DoSort(), FuncTest::func2(), FuncTest::func3(), CDefView::GetArrangeParam(), GreaterTest::greatereq(), GreaterTest::greatert(), IncludesTest::incl2(), LessTest::lesseqt(), LessTest::lesst(), ListView_SortEx(), BtrfsDeviceAdd::populate_device_tree(), SortBuffer::PrepareMerge(), PrintBugreport(), psh_hint_table_activate_mask(), psh_hint_table_find_strong_points(), CDefView::Rearrange(), should_balance_chunk(), SortTest::sort1(), SortTest::sort2(), SortTest::sort3(), AlgTest::sort_test(), test_GetDefaultColumn(), test_ldap_parse_sort_control(), UnorderedTest::umap(), UnorderedTest::umultimap(), UnorderedTest::umultiset(), UnorderedTest::uset(), and xsltComputeSortResult(). Definition at line 1006 of file _algo.c. Definition at line 866 of file _algo.c. Referenced by test_stable_partition::operator()(), PartitionTest::stblptn0(), and PartitionTest::stblptn1(). Definition at line 1197 of file _algo.c. Referenced by test_stable_sort_1::operator()(), test_stable_sort_2::operator()(), SortTest::stblsrt1(), and SortTest::stblsrt2(). Definition at line 1207 of file _algo.c. Definition at line 348 of file _algo.c. Referenced by UniqueTest::uniqcpy1(), UniqueTest::uniqcpy2(), and unique(). Definition at line 358 of file _algo.c. Definition at line 1058 of file _algo.c.